This is a good example of how plentifull seaweed can be when blown onto the beach by storms. This is at Lahinch on the west coast of Ireland. Seaweed contains over sixty minerals and trace elements, along with numerous bio stimulants, and it also contains iodene which is an excellent disease suppressant. As you can probably tell, I’m a bit of a fan of our sea-borne, slippery friend, and no wonder. All of the above reason contribute to make seaweed a top class supplement for both grass and garden. the goodness can be extracted from seaweed to form a concentrated seaweed liquid. In modern fertilizer use, liquid seaweed makes a highly efficient base for the nutrition of a wide variety of plants. This is because it can be safely mixed with most of the commonly used sources of nitrogen, phosphate and pottassium, along with supplements like iron. The seaweed stimulates the soil bacteria which, in turn, helps to release much of the nutrient content. In many cases these nutrients are fixed in the soil and not available to plants, whether you’re feeding grass, tomatoes, vegetables or flowers. Seaweed combats this, helping you to make the most of any nutrients being applied, and reducing the quantity required for healthy growth. To add to the list of benefits, seaweed is also valuable in helping to break down organic matter. This is a particular benefit when treating turf, where thatch can be a serious problem if not managed properly. Finally, as if we haven’t heard enough about the wonders of seaweed, it’s also very high quality food supplement for both animals and humans. But, let’s not get greedy – before we go and eat up our entire supply, let’s first deal with its uses and benefits on our lawn and garden. The benefits of using seaweed on plants was first discovered many years ago by farmers living and working beside the sea. They would harvest the seaweed from the shore as it was washed in by storms, then spread it on the land prior to planting the crops. The benefits were particularly noticeable on potatoes, always susceptible to disease, as the fields treated with the seaweed consistantly produced better crops with very clean skins. One side effect to seaweed use was the presence of a very distinctive flavour in the potatoes, something quite noticeable when compared to normal potatoes. This is something that is no longer an issue, though, now that farmers have access to very easy-to-apply granular fertilisers. This variation of the seaweed fertiliser doesn’t have the same side effect, the strange taste disappearing during drying or granulation. The seaweed fertiliser was also found to improve soil quality over a number of years. This is now known to be because the alginates act as a floculator, breaking down heavy soils into a crumbly free draining material. Conversely, almost fifty percent of the seaweeds constituents are humous forming, so light sandy soils become more fertile and less prone to drought damage. How Can Seaweed Help Your Garden? If you are lucky enough to have access to fresh seaweed it can be spread straight onto the garden. Although it can be dug into the drills fresh with potatoes, the best way is to collect it during Autumn and Winter when stormy seas will provide you with ample material. Then you can spread it onto the surface of the vegetable garden where it will break down a little over the cold season, suppressing weeds as an added bonus. Then, when spring comes around, you can dig the material straight into the soil. Seaweed can also be used as a mulch in and around shrub beds, annual and perennial borders, where it will break down slowly, releasing nutrients into the soil, while again acting as a natural weed suppressant. The one exception would be to avoid treating rhododendrons, azealias and other acid loving ericacious plants. This is because seaweed creates quite alkaline conditions, not conducive to these types of plants. 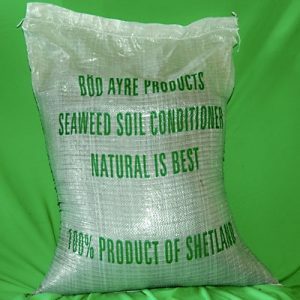 Looking for Pre-Prepared Seaweed Fertiliser? If you don’t have easy access to the beach, then there are a range of pre-prepared seaweed fertilisers on the market. You’ll find seaweed extract as one option, and this organic concentrated seaweed fertiliser from Shropshire Seaweed is a good option. I hope you enjoyed my guide to seaweed, it’s benefits and where you can use it in your garden. Next week I’ll be posting an article on the different types of seaweed products that are currently available to the home gardening and lawn care market. I hope you come back to find out more. If you have any experience of using seaweed yourself, I’d love to hear about it. Please leave me a comment in the comments area below, letting me know what you think about seaweed for lawn and garden care. Your experience would be much appreciated. Please would you be so kind as to inform me as to when to apply liquid seaweed to my lawn? Also I notice in your picture that you have used sulphate of ammonia with the seaweed.I apply sulphate of ammonia in liquid form. How much liquid seaweed should I add to it? Hi Allan, Seaweed can be applied at any time of the year but is most beneficial in Spring and Autumn when the grass is most active. Aeration immediately beforehand helps to make the most of the seaweed. Hi Duncan, Just reading your article. I live in Ireland and am very fortunate to have a beach right beside me. I have planted potatoes and onions. I planted seaweed ontop of my seed potatoes and they are coming up lovely, but I am concerned about blight. I read in your article about seaweed preventing blight. Do I just cover the leaves completley in seaweed? and also do I need any other blight prevention along with the seaweed? I have an acre of garden near Campbeltown, West coast Scotland, and have used seaweed for more than half my life! I am 71. I collect it from the beaches when i can, and also from the fish farm. There it is separated from the sea water, before the water is circulated to the fish. Many tons have been added to my clay soil, and the soil is more friable. One year my trailer was out of action, and some of those to whom i had given potatoes said they were not up to the usual superb taste! My soil is still heavy clay, but that is because the white clay subsoil is being drawn up as the soil becomes easier to work! I have composted some that was surplus to immediate need, but just put it thick on the ground and let weather and worms do the work. My rhubarb is now forcing its way up through the fresh seaweed mulch, and i must get round to covering it with light impermeable covers before the invertible frost cuts it back! Most of my asparagus has died through root rot of some kind, probably because of the water logging of the trenches from the intervening heavy clay. I keep planting from seed in the hope of success! Hope the above is of some interest to someone! can fresh seaweed straight from the sea be spread on my lawn over winter to improve the grass. It will improve the grass Gordon but the smell will be a bit fresh for a while. Much easier to compost the seaweed in layers with a good sand, then apply the compost when it is sufficiently broken down, or buy a ready made seaweed liquid product and apply on a regular basis. Will any seaweed do ? Are there any to avoid ? I live on the south west coast. All seaweeds are excellent in the garden. You just need to avoid picking near sewage outfalls as it could be contaminated. Otherwise no problem. The kelps are better composted first as they don`t break down as quickly as other finer species, most of which can be dug in right away. Hi Nik, thanks for getting in touch. The easiest way to get a liquid from the seaweed is to use a garden shredder to break up the material, then half fill a barrel with the shredded seaweed. Fill the barrel to the top with water, hot water will speed up the breakdown of the seaweed but cold will work fine. Stir or shake the barrel every week for around three months minimum, then strain off the liquid which will by that time be ready for use on your plants or lawn. The longer you leave the seaweed in the barrel, the more nutrients will be extracted. Application rates for the liquid will vary depending on the strength, so some experimentation will be required to get the best results. Do not discard the remaining remaining seaweed after straining, as this can be used as a very useful addition to the compost heap, or for mulching around plants. Thanks for your advice. I don’t have a shredder but found my mower used at a tilt on small piles of seaweed reduced it to c1cm pieces in a few passes. These were thinly spread and were taken into the lawn in a few weeks. The slimy nature of the seaweed seems to be improving the water retention of my sandy seaside soil. The thick ropey stems of the seaweed get left behind by the mower but are easily raked up and popped into the compost. I did the same to autumn leaves and am getting a definite improvement. Seaweed is great! I was wondering how often liquid sea weed should be applied to lawn? Is it a case of the more the merrier? Hi Rob, seaweed liquid comes in many strengths, but on average it should be applied every four to six weeks over the growing season. I have just applied Maxicrop Concentrated liquid seaweed to my lawn. The dosage used was 5 tablespoons to a gallon of water and I used 5 gallons to 85 sq metres of grass area. My question is what would be the reaction if I have over-dosed this lawn area? The grass appears to be patchy. In September of last year I over-seeded and the lawn was looking good. Your advice would be appreciated. Hi Stan, thanks for the enquiry. I have used seaweed for over forty years, in many different forms, and have never seen any evidence that over dosing causes any problems. The amount you used should certainly not result in any damage to the grass. It sounds to me that you may have a problem with leather jackets, the grub of the cranefly, or possibly some environmental damage over the Winter. It has been a very slow growing Spring, so some Nitrogen and iron fertiliser should be applied to get the grass growing now that the soil is warming up.